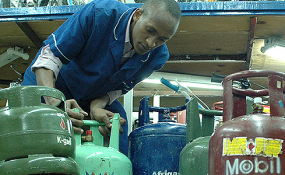 The government intends to implement the introduction of piped cooking gas in residential areas but Kenyans on Twitter seem to be unenthusiastic about the idea. Appearing for an interview on KTN, the Ministry of Energy Principle Secretary Andrew Kamau said that this would be realised through the government's affordable housing project. The gas would come directly to the kitchen through a pipe system. This, he says, will help in doing away with the gas cylinders. "We are about to change the legal notice to allow for piped gas to all those low cost housing. So you do not have to move around with those cylinders. It will come to your kitchen through a prepaid meter if you want or through a metered system that can be billed to the provider," said Mr Kamau. Kenyans on Twitter however had a problem with the project with their main concern being on the high risk of fire breakouts. They also asked the government to first make sure that all housings have piped water. "Can we just get to the point where people in Turkana are not dying before we get piped gas? Can all schools have Chemistry, Biology, Physics and IT labs before we pipe gas? Can all hospitals have all drugs available before we get piped gas? No police harassment first please?" Everlyn Mung'au posed. "There is ambition, then there is just plain stupidity. Can we get every Kenyan clean running water first? Learn to prioritise basic needs first," Chabebetuja wrote. "If you can't control fires how will you manage to meter gas," Dave Amolo commented. "If this happens nahama tu Nairobi. I can't be moving around worried about when and where the next fire will break out," Cryptic said. "That's a big dream sir, start by getting enough piped water to Kenyans. Enough with these scam project!" Tracy Pickett tweeted. "If the government cannot handle a basic need such as piped water, will explosive gas be any easier to deliver to its citizens? Last I checked, even sewer lines do not exist in some parts of the city," Charles N said. "Get sewer and water systems working first. Most importantly remember that gas pipes don't work well with reckless management, allow them to leak like ur sewer lines do and its gonna be ur last mistake on earth," Mkenya wrote. In August 2017 the Energy Regulatory Commission announced that it was working on a plan that would require housing developers of gated communities to include piped gas systems in their constructions -- similar to other essential services such as electricity and water systems.